The goal of our research is the development of advanced robotic systems for surgery. Such systems allow new surgical procedures which are highly economical and precise. Improved treatment outcome, patient comfort and less invasive treatment are further benefits of these technologies. We investigate both new methods for planning robotic surgeries, delivering robotic surgery under real-time tracking of respiration and pulsation, and basic imaging technologies for navigation. Our technologies in the field of navigation and robotics have found widespread clinical applications in neurosurgery, orthopedic surgery and radiosurgery. Technologies invented by members of our group are in routine clinical use at many leading clinical facilities worldwide. To date, more than seven thousand patients have been treated with our new technologies. The range of applications includes trauma surgery, corrective osteotomy, lung-, spine- and brain-cancer treatment. Parkinson's disease (PD) is a widespread degenerative neurological disorder of the central nervous system with a marked degeneration of dopaminergic neurons in the substantia nigra, pars compacta of the brain mesencephalon. Cardinal symptoms for PD are tremor, a reduction and slowness of movements, akinesia, and rigidity. Deep brain stimulation (DBS) presents an effective treatment to reduce or reverse these symptoms. Also for other cerebral disorders such as dystonia, DBS by the means of implanted electrodes presents an accepted technique for treatment Target areas for electrical high frequency stimulation (HFS) are the thalamus, internal globus pallidus (GPi) the subthalamic nucleus (STN). Despite positive effects of HFS, the biochemical mechanism of DBS remains unclear. Research activities are therefore concentrating on analysing neurotransmission under HFS in animal models as model regions e.g in the Wistar rat show strong correlation between electrical stimulation and changes in the neurotransmitter concentration. Targeting the STN and/or the GPi in the rat brain, however, can not be done easily as both structures are of small size. Within the common approach, probe placement in the rat brain is performed with a manually operated stereotactic frame for small animals. Disadvantages related to this approach are systematic inaccuracies, low repeatability, and an imprecise correlation of measurement signals to spatial position. The development and application of a robotic system for stereotactic neurosurgery on small animals would therefore significantly improve brain research conditions on the small animal. in the field brain imaging with OCT. It has been shown that tissue structure in vitro can be displayed by OCT (e.g. grey and white matter) and that tumorous tissue can be reliably identified. 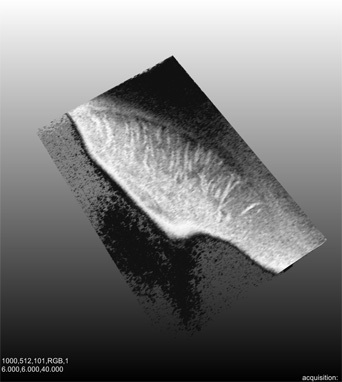 Optical Coherence Tomography (OCT) is a relatively young imaging technique. 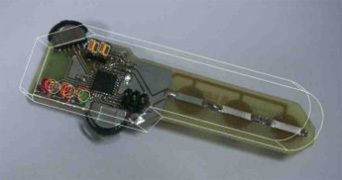 Based on the principle of interferometry, its functionality resembles the principle of ultrasound. In OCT imaging, however, near-infrared light with a wavelenght of 800 to 1500 nm is used which is scattered by the examined sample. The advantages of OCT imaging is the high resolution (1 – 10 mm), real-time capability, and the atraumatic imaging (no direct contact to the sample is needed). Disadvantage is the small imaging depth of 2-3 mm. OCT has been used in many medical applications, major developments have been made in the field of ophthalmology, dermatology, and urology. Little work has been done in the field brain imaging with OCT. It has been shown that tissue structure in vitro can be displayed by OCT (e.g. grey and white matter) and that tumorous tissue can be reliably identified. 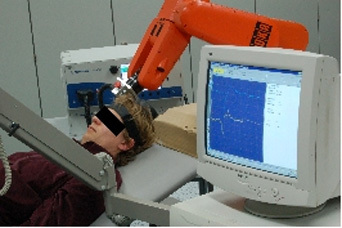 Aim of the project is to develop a robot assistance system for delivering TMS. Furthermore, we work on a statistical brain mapping procedure to localise muscle representations in the cortex. Precise targeting of stimulation points. Precise tangential orientation of the stimulation coil. Simple planning and fast probing of grid-like stimulation patterns. Motion compensation keeps coil in place even if the patient moves. A fixation of the head is not necessary any more. For the brain mapping algorithm we combine all three essential pieces of information: The coil positions for stimulation, the corresponding muscle responses, and the characteristic field of the coil used. The main idea is to assume a monotonic functional relation between the electric field strength at the representation point and the evoked muscle response. Using a refined algorithm for Correlation Ratio and Kendall's rank coefficient TAU, we are able to calculate likelihood maps for the representation of specific muscles. A lot of diagnose and treatment systems, all requiring much space, are used in today's operating theaters. In this context, the microscope is a very important device. At the moment, all these instruments have specified application fields, which can't be combined. We use Möller-Wedel's latest OR-microscope and, together with IBG Technologies, a motorized assistance system is under development. This system makes it possible to combine pre- and intraoperative images and to simplify the useage of the microscope. Currently, the microscope must be adjusted manually by the surgeon. To do this, he has to hand back the instruments, enable the microscope, adjust its position, take the instruments and finally he has to find his way back into the operation area. These steps increase the risk of infections and incidents. After having motorized the microscope the surgeon can easily control it using a remote control. This reduces operation time and thus the patient can be kept in anesthesia for a shorter time. 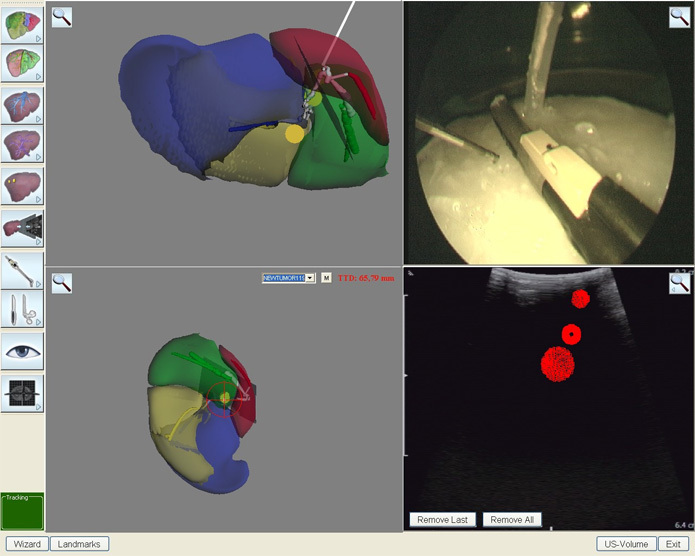 It is also possible to display preoperative data in the actual microscope view with a special mirror system. The MRT- and X-ray-images shall be presented at the correct position and the origional size. On top of this, tissue and vessel structures will be calculated from these images and will help the surgeon to navigate. Optical coherence tomography (OCT) is a relatively new method, which can be used for diagnosis by the surgeon. 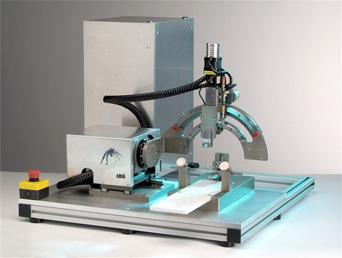 An OCT system will be integrated in the motorized microscope and can be positioned automatically. The project aims on supporting surgeons doing minimally invasive procedures on the liver, especially resections on certain liver segments (II and III) and laparoscopic ablations. The system shall enhance the surgeons orientation by means of virtual reality and augmented reality. For this purpose, a tracking system is needed. In our case, we use an electromagnetic tracking system which avoids the line-of-sight problem and offers very small trackers.